What seems like several lifetimes ago, a very shy little boy was forced into a job at a local Donut Shop in San Francisco. Well… ‘forced’ may be too harsh of a word, but it certainly wasn’t my idea to get up early on Saturday mornings to scrape parchment paper pan liners and wash sheet pans. My father had decided that his enormously shy son needed to get out of the house and actually interact with people once in a while – and he knew the owner of the donut shop really well. There was an old German baker there named Hans. Well… I thought Hans was old, but as I look back I don’t think he was more than 35 at the most. He was a bit gruff, which made him seem old to this timid little kid. Hans made all the pastries and coffee cakes, and he made it look so effortless. 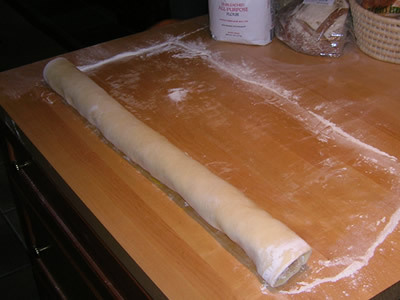 Over time, as I had finished scraping the parchment paper and caught up on washing my sheet pans, Hans would let me roll out his pastry dough. He was extremely picky about how it was done, and I soon found out it wasn’t nearly as effortless as it appeared! It was exacting work. 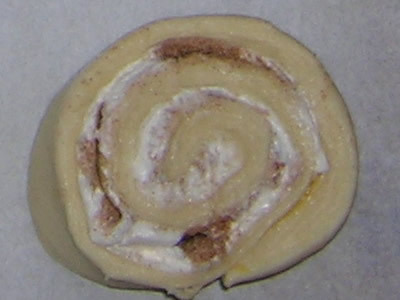 Proper temperature, proper pressure while rolling, rolling in certain directions to achieve proper proportions. In his heavy German accent, Hans explained to me why it had to be a certain way. He taught me how to feel the dough, what to look for, how to count (and remember!) how many times it had been folded and refrigerated. Those early years at The Donut Center became the foundation for a life that has been involved in food – in one way or another – for the past 45 years. This little stroll down Memory Lane comes because of an email I received a few days ago. Back in 1966, I quit the Donut Center in a huff. I got into a fight with the owner – I have no idea what it was about – and got a job at Blum’s downtown. Blum’s was an institution in San Francisco. It was where blue-haired and bejeweled matrons held court over sumptuous sandwiches and even more decadent desserts, and where mothers and grandmothers brought their daughters, in their maryjane’s, gloves, and with ribbons in their hair. It was located on Geary Street across from Union Square. It had a back entrance into Macy’s. Blum’s Coffee Crunch Cake was one of those desserts – and it was to die for. Fast forward to April, 1995. I am volunteering at Project Open Hand in San Francisco – an organization feeding AIDS patients throughout the city. I strike up a friendship with a woman named Helen Kane, who, after we share histories a bit, tells me she has the original Coffee Crunch Cake recipe from Blum’s! The following week, she brings me the recipe, neatly written on a 3×5 card. In the ensuing 11 years, I have made the cake numerous times – always to raves. It’s a bit time consuming, and you can’t make the coffee crunch on a really humid day, but it is one damned good cake! Several years ago, on epicurious.com, I mentioned in a review of Blum’s Coffee Toffee Pie, that I had the recipe, and I have shared it freely for years. The email was from Sandy Weil, the daughter of the man who invented the Coffee Crunch Cake! She said that her father, Ernest Weil, had worked at Blum’s in the mid-40’s and had created the cake, and left in 1948 to open his dream bakery Fantasia Confections in Laurel Village – a small shopping district on California Street in the Laurel Heights neighborhood. The even better news was that her father had finally written a cookbook with all the recipes they had made there for 40 years! Of course I had to buy one, and the autographed copy arrived on Monday! 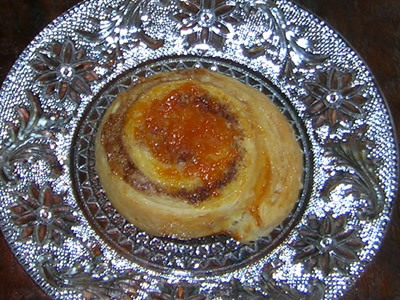 I’ve been having a blast reading the stories, reading the recipes, and deciding what to make “first.” I finally decided that my trip down Memory Lane had to start with Danish Pastry. It was, after all, the very first thing I ever learned how to roll out, lo, these many years ago. Making Danish is a two-day process. The dough needs to sit overnight after the rolling/folding/rolling/chilling – repeat – repeat – repeat… But it is sooooo worth the time and effort! They came out fanfreakintastic! Light, flakey, buttery. The perfect amount of sweetness. I brought two over to our next door neighbors – still warm from the oven – and ten minutes later I received a swooning phone call thanking me profusely! They are really really good! Ok lovie, time to update. It has been nearly amonth and I think these Danish pastries are drying out.